Wasp stings may seem like a minor problem, but it some cases they can be dangerous and even fatal. They also hurt quite a bit. It is recommended that everyone living or spending time near wasp nests knows what to do in case of a wasp sting. 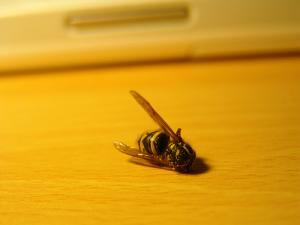 Wasp stings are always painful, even for people who do not suffer from allergic reactions to their venom. Unlike bees, which lose their stinger after they sting and can only sting once, one wasp can afflict several stings at one time. These double-winged insects have a tubular structure at their bottom, which they use to pierce the skin and sting, and to inject venom. Most types of wasps live in colonies, and when one of them feels it is in danger and it attacks, it sends a signal to the others near by which may come and attack too. The sting causes pain, burning, redness and swelling at the puncture site. However, if there are multiple stings, the symptoms may become more severe, with fever, headache, nausea, dizziness, difficulty breathing, choking, swelling of the neck and the face, blue lips and fingernails and shock. Person who exhibits these symptoms must be taken to an emergency room at once. The same symptoms are characteristic for an allergic reaction, which also needs to be addressed immediately. If the victim of the sting is not allergic to wasps and their venom, the sting can be treated locally and the symptoms usually go away soon. The first thing to do is to make sure the stinger is no longer attached to the skin. If it is, it needs to be removed, because as long as it is in the skin, it keeps injecting venom. The best way to remove the stinger is to gently scoop it out with a sterile needle or with tweezers. It can also be removed by scraping the skin gently with the flat part of a butter knife. After the stinger is removed, the area should be washed carefully and thoroughly, using a mild soap and clean, running water. Ice packs can be applied to reduce swelling, redness and pain. The ice should not be in direct contact with the skin, and it is better to wrap it in a clean cloth. The ice will also prevent the venom from spreading further into the body. Vinegar or lemon juice, diluted in some water, can be applied to neutralize the effects of the venom and to cool the skin down. Medications can be taken to relieve itching and pain. Antihistamines will alleviate the itching while pain killers, such as ibuprofen or acetaminophen, take care of the pain. Other remedies that can be very helpful for a wasp bite include clay paste, chili paste, lavender oil, mint, toothpaste, even nail polish or deodorant. What are possible toxic effects of bee venom? What natural remedy to use for bee sting allergies? Can bee sting give some people an allergy reaction? Is there a difference between a wasp sting and a bee sting? Is there some kind of home remedie for removing bee sting in hands?